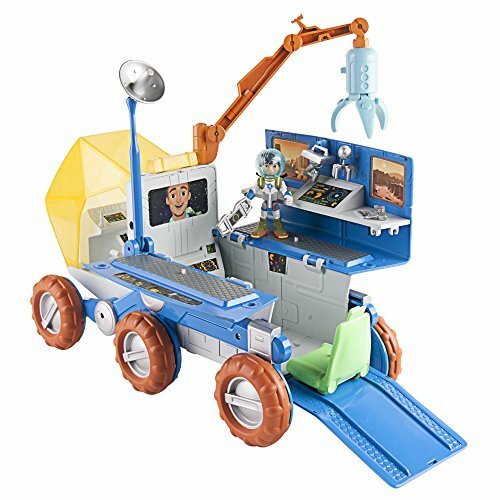 Miles and his friends are all part of the Cosmic Explorers who use the Mission Rover as a mobile space lab. Onces the Cosmic Explorers reach their destination they can open up the back of the Mission Rover to reveal the mobile space lab. Inside the lab, Leo can give Miles missions with the touch of a button. To help Miles complete any mission the Rover has 2 Robotic Arms that can be moved to different locations on the vehicle to blast away obstacles with the flash beam launcher, or move space debris with the grappling claw. Miles can use the Terra Skiff for any missions that require him to leave the safety of the Rover. Once Miles is ready to use the Space Lab, it is equipped with 4 space tools, including robot IO, to help with whatever he may need. Robotic Arms can be removed and reattached at 7 different locations on the vehicle. Includes removable flash beam launcher.